Jeffrey Young founded Allegra Strategies and The Allegra Group in 1999. Jeffrey holds a business degree in Finance and Economics and an MBA (with Distinction) from the University of Houston. Jeffrey has worked within research and strategy consulting for nearly 20 years having managed an extensive range of research projects within the retail, leisure and consumer lifestyle sectors. He also plays a hands on role in Allegra’s consumer research teams. Prior to setting up Allegra Strategies, Jeffrey spent 3 years as a strategy consultant with London-based Burlington Consultants and as a freelance consultant with Roland Berger & Partners London. Jeffrey’s early career began in the hospitality industry where he completed studies at the Ryde College of Hotel and Catering Management in Sydney, NSW Australia. 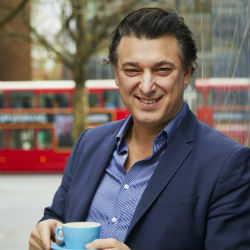 Jeffrey is a full member of the Market Research Society and with his passion for coffee is co-author of The London and The New York Coffee Guides, Founder of charitable UK Coffee Week, The London Coffee Festival and Chairman of The Allegra Foundation charity. Jeffrey is also a Director of Australia-United Kingdom Chamber of Commerce, a business networking organisation affiliated with the Australian High Commission. Jeffrey is frequently invited to feature on TV, BBC radio and in mainstream newsprint to provide commentary and analysis on major UK retail and coffee sector trends.